Young lovers from Morocco. Photographer: Alexandre Baron  (via Flickr: Creative Commons License). 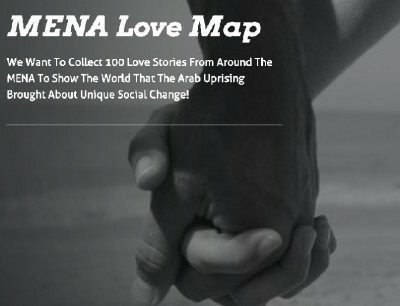 MENA Love Map  is seeking stories of love during the so-called Arab Spring. Their goal is to collect and publish “100 love stories from around the Middle East and North Africa (MENA) region to show the world that the Arab Uprisings brought about unique social change.” They want your contribution . The brainchild of a fiercely anonymous couple, who themselves are lovers who met during this period, this is their story. Maya Norton (MN): I know you want to remain anonymous. What can you tell us about yourself? Mena Love Map (MLM): We will remain anonymous until we gather 100 stories. We are two bloggers and lovers from different countries in MENA who crossed roads after the revolutions [of the Arab Spring] and decided to fight together in our different causes and support each other. That's why we believe the uprisings in our region should be approached as an opportunity rather than only as crises. MN: When you say “love stories,” do you mean romantic ones or also good news that happened as a result of the Arab Spring? MLM: We really detest the expression “Arab Spring.” We think it is a Western creation to decide our fate. What we mean by “love stories” is anything that was inspired, influenced, came as a result of or spanned around the post-2010 movements in our region, when new hopes started to arise and new forms of resistance manifested, resistance by demonstrating, but also resistance by love. MN: How did the idea for MENA Love Map originate? MLM: The idea originated from our love for each other, joining hands in our struggles and fighting for our causes in the region. We started discussing the idea last summer during the war in the Gaza Strip, in Iraq, the coup in Egypt, the continuous massacre in Syria, etc. It really reached its peak this summer where everything was fucked up and overwhelming in the region, generating only desperation. We thought: we are strong with our power to love, to support each other beyond the borders despite what our countries are enduring, and [we] succeeded to continue the fight for hope, determination and [with a] big smile on the face. We thought: we are definitely not the only lovers who had this opportunity to meet, unite, and fall in love because of indeed those same crises in the region. We want to diffuse the love energy to our fellows in the region. MN: What will the lovers map look like? MLM: The main idea of the map will be to click on [the] countries where there is a story that can link to points of meetings of lovers beyond borders. You know, the concept of borders is very important in the MENA [region], especially in countries, for example, like Bahrain, Syria, Libya, Egypt, and others who left their countries as refugees and cannot come back. So the mapping is really about crossing borders and [being] able to meet your lover on the other end of the Mediterranean or any other ocean. MN: What is the ultimate goal of the website? MLM: The website is just a platform to collect, document, and diffuse. Our aim is the process of collecting, telling, and sharing these stories by lovers themselves. Thanks to MENA Love Map's founders to agreeing to the interview. If you don't have a love story to contribute but are interested in helping out with the project, you can sign up to volunteer .